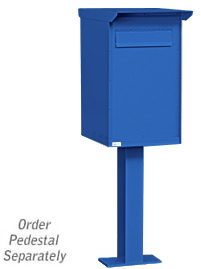 [XPB-427X-X] (DISCONTINUED) Pedestal Drop Boxes are constructed entirely in Aluminum and Mailbox Box is 27" High and 19" Deep. Drop boxes are available in three (3) Widths: Regular - 15-3/4'', Large - 23'' and Jumbo - 30-1/4''. Secure locking courier envelope pedestal drop boxes are accessed from the rear through a two (2) point latching master door on the XPB-4275 and two (2) master doors on the XPB-4276 and XPB-4277. Each door swings open 90 degrees for unloading. Standard units include a locking “T” handle on the rear door(s), a weather protection hood and a mail flap on the front of the unit. Units can also be customized (related item XPB-4280) with front and/or rear doors, larger slots or no slots, multiple compartments or as specified to meet your requirements. The pedestal drop boxes feature a durable powder coated finish available in three (3) contemporary colors and are equipped to mount on included pedestal (XPB-4285) or a base of your choice. Custom engraved placards and custom colors are available as options upon request. For shipping quotes, orders or questions please call our Customer Service Center at 1-877-483-9270.